Everyone has their own wishlist of features, and we want to heard them. 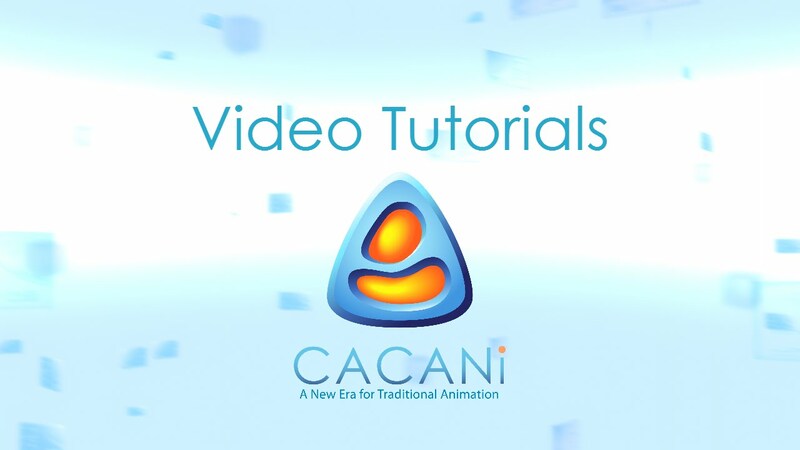 After you are familiar with CACANi and its capabilities, if there is any abilities, or tools that you wish to be considered for future incarnation of the software. Please write them here. Could put a "magnetic tool". This would be very useful. Imagine making a key, copy it and then adjust with the magnetic tool, and apply the automatic inbetween. Could use this to move heads, arms, legs, with just a drawing. Very interesting! What software is the demo from? Hi Jose The software is animestudio. I think this feature would be powerful, along with the automatic Cacani inbetweening. OK, great. Thanks Max. We will definitely study this. I could use an eps file export. Hello Dale, right, we will certainly look into it. We are looking into the audio for sure. Lip sync would be ideal. Definitely in the list for consideration. With the new type of cell, you would put them all in it, but the visibility would be on for only one layer in that cell all other will be invisible. If you change the layer that is visible all the other layer would still be invisible. This change will show up as keys on the time line by allowing a hold through the tweens. Has you have it now Duplicate Selection to hold layers is not very convenient to Lip sync. Then the next step would be Papagayo support. Hello Dale, audio is one area of interest for us. The suggestion you proposed is one way to consider when we review the subject. Thanks for this suggestions! Last edited by Jvelasco; 12-21-2014, 09:10 AM. Just to make an addition to the Lip sync, I think it should also allow users to import their own voice audio, so that it can auto-generate the words said. And if it makes a bit of a mistake and puts the wrong word in, users should be able to correct the text, without mishaps, and without having to draw the mouth individually in a separate layer. Another feature that I think needs improving is the inbetweens feature. Whenever I draw out keyframes and generate the inbetweens for them, other lines seem to go a little all over the place, meaning that I have to edit each of the inbetweens manually (which is a little stressful). I think that area needs improving, to avoid any gaps on the inbetween frames, or lines having to go off position. Hello FCU777, Will consider your suggestion regarding audio. About the Inbetween improvement, I have a feeling that your result may deal with movement involving 'rotation', or a 'curved path". CACANi handles inbetweens linearly, so if by any chance any movement needs a curved path motion or some form of rotation, you will need to use the 'Bone tool'. Can you post the 2 keys, that way we can see the motion dynamics you are dealing with? Here are video tutorials on Bones, and Quick-Flip. Last edited by Krisoyo; 12-24-2014, 07:12 PM. Last edited by Jvelasco; 12-26-2014, 10:11 AM. Hello FCU777, now i know the problem. 1. You need to extend the neck line (stroke) to meet the lower neck portion of the drawing. It is recommendable that that those strokes have the connection on equal position on the both key frames. What is the difference between hidden strokes and invisible strokes? Algo interesante seria habilitar una modalida auto generate inbetwening para ir de key en key dibujar y de modo auto se creen la animacion para animaciones rapidas, asi mientras dibujes veas el resultado de inmediato. Interestingly would enable a modalida auto generate key inbetwening to go in key drawing and animation auto mode for fast animations are created, so while you draw you see the result immediately. Sabes que es el "Quick-Flip"? Quick-Flip muestra una animacion de como serian los in-betweens, quicl-flip muestra solo la animacion entre dos keyframes? o todos los que haya? y si no es asi implementaran una forma de ver un quick-flip de todos los keyframes? Hola Juanes, en el momento "Quick-Flip" solo funciona entre 2 key frames. En versiones futuras habran mejoras. Tomaremos en mente la sugerencia. Hum?... me pregunto, cual es la diferencia entre Hiden y Invisible stroke? Hum? ... What is the difference between Hiden and Invisible stroke? La differencia de las lineas "Invisibles" y las "escondidas" son que las invisibles actuan como lineas normales solo que no se ven. Las lineas escondidas actuan como si no existieran. La rason es para que CACANi pude mantener las cantidad de lineas equivalentes para poder crear los inbetweens. Mira la imajen para referencia. Last edited by Jvelasco; 12-30-2014, 04:14 AM. Como dese el usarlo. Estan creadas para ser flexibles. Se creativo con ellos. Last edited by Jvelasco; 12-30-2014, 06:32 AM. In this video Jose Velasco explains it very well. It is always good to see the tutorial videos has many valuable INFORMATION. All times are GMT8. This page was generated at 09:13 PM.